This took my eye in large part because of the description of its form in the Lyric blurb and in the many reviews that have followed its progress around the world since 2010 following a commission by Battersea Arts Centre, Malthouse Theatre Melbourne and the University of Chichester. Theatre company 1927, made up of writer/director Suzanne Andrade, film and animation designer Paul Barritt, costume designer Esme Appleton and composer Lillian Henley, had a big hit in 2007 with Between the Devil and the Deep Blue Sea at the Edinburgh Festival. This was the follow up. 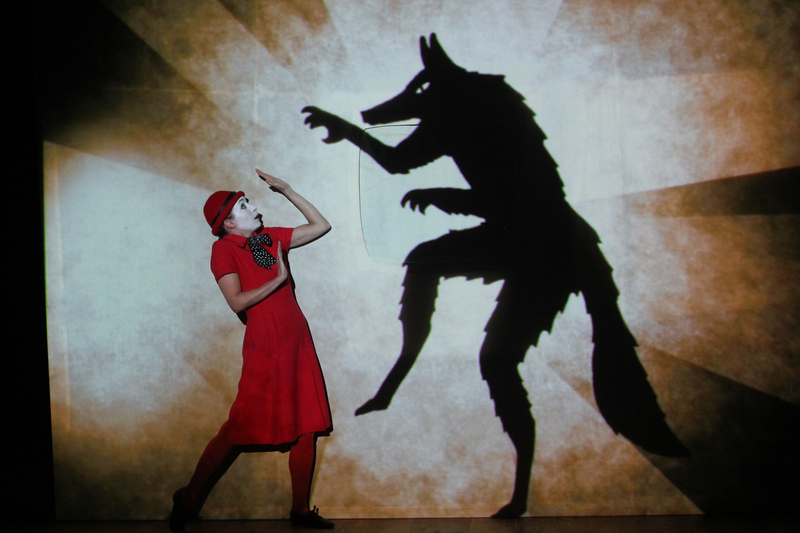 It combines animation and video design with live music and songs, narration and performance, like a “graphic novel burst into life”. It is, technically and creatively, a tour de force even if the story itself doesn’t quite match up. Bayou Mansions on Red Herring Street, in the Bayou, is a decrepit tenement block in an imagined city, where the poorest members of society are concentrated and the feral kids run riot. Agnes Eaves and little daughter Evie pitch up with an ambition to change things through the power of Blue Peter-ish craft. A reluctant janitor steps in to help. The kids invade the posh neighbourhood. You can guess the rest. The plot, as in most parables, doesn’t stand up to much scrutiny, and the subversive message, let the kids play again in public spaces, with a few nods at wider social and economic injustice along the way, isn’t really developed. Who cares though when this level of visual and musical invention is on show. Mr Barritt’s animations are stunning. The aesthetic is 1920’s German Expressionism/Berliner cabaret filtered through 1970s kids cartoons with Tim Burton lurking in the background (in my head at least). The way that the three white-faced performers, Genevieve Dunne, Rowena Lennon and Felicity Sparks, integrate their movement, performance, piano music and costume changes with the moving animation, is occasionally breath-taking. The monologue narration of the caretaker, voiced by James Addie, is similarly seamlessly integrated. There is plenty of dry wit from this, and other characters, and a few (not enough mind) sinister undertones. This wasn’t full on our visit and there are a few tickets left for the remaining performances. It might be that the Lyric is a little on the ample side capacity-wise for such a show, and I am not entirely sure the younger patrons, and indeed LD who I roped in to coming along, were entirely persuaded, but if you are prepared to take a punt and revel in the craft on show the is well with the £20 or so asking price.